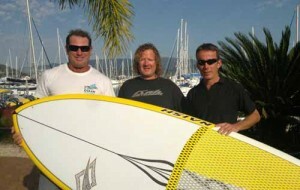 The 2012 Naish Paddle Against Plastic was held on the 29th September from Mackay to Airlie Beach, a total of 120km (65nm). The paddle was about raising awareness of the issues plastics pose to our oceans and to our own health. Paddlers Ian Thomson, Luke & Tris Mairs and Kyle Rose paddled 17ft Naish Javelins and spent just less than 14 hours on the water.